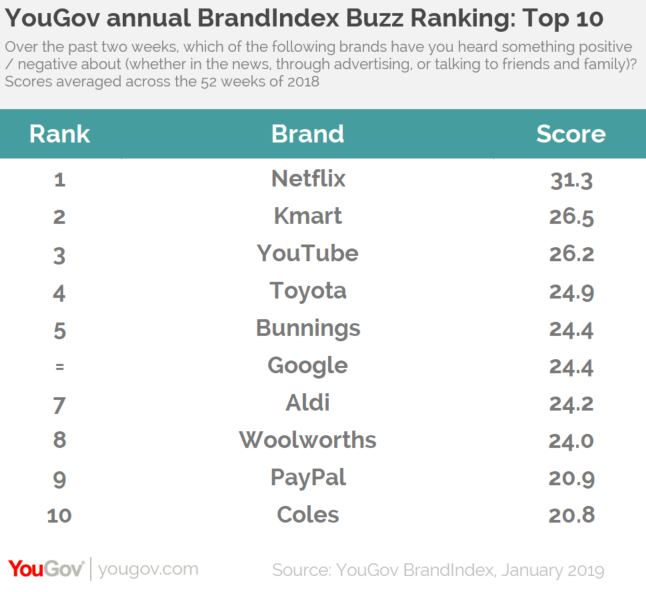 on January 23, 2019, 5:54 p.m.
Netflix takes the top spot in the annual YouGov BrandIndex Buzz rankings for the second successive year. While the subscription video streaming service tops the list, retail brands feature prominently in the top ten. Retail store Kmart takes second place (26.5), hardware chain Bunnings tied in fifth (24.4), discount supermarket Aldi in seventh (24.2), hypermarket Woolworth’s in eighth (24.0) and its competitor Coles in tenth (20.8). Digital brands also make up a significant proportion of the list, with video sharing platform YouTube in third (26.2), internet technology giant Google tied in fifth (24.4) and digital wallet PayPal in ninth (20.9). The list is completed with Japanese automotive manufacturer Toyota in fourth (24.9). 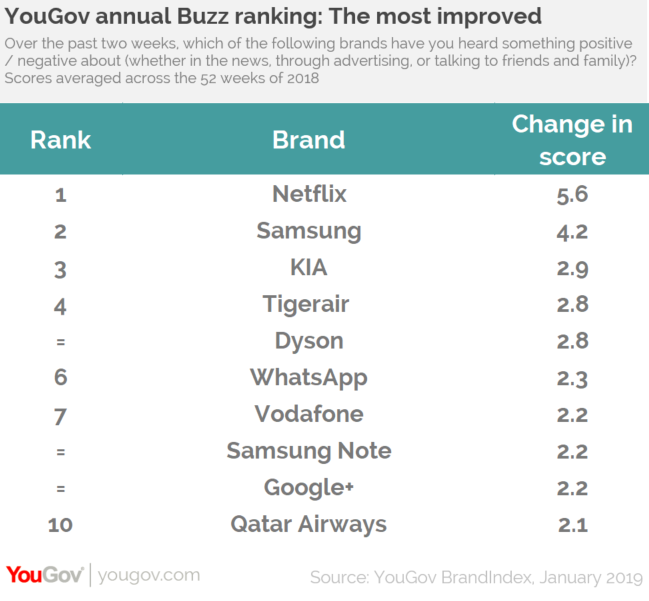 YouGov also reveals which brands had the most improved Buzz score. Netflix also tops this list with an increase of 5.6 points. It appears ahead of South Korean electronics manufacturer Samsung (up 4.2 points) and South Korean automotive manufactuer KIA (up 2.9 points).